Nokia announced that the Nokia X, part of the new Nokia X family of affordable smartphones that run Android™ apps, will begin selling in India. The new Nokia X family that includes Nokia X, Nokia X+ and Nokia XL is the perfect introduction to the world of Android apps, coupled with signature Nokia experiences, and the most popular Microsoft services. “India is one of the fastest growing markets for smart phones in the world. With the launch of Nokia X, we are adding more ammunition to our smartphone portfolio. We believe Nokia X is a unique combination of Nokia quality and experiences, Microsoft services and Android™ apps. It will resonate with consumers and set a great precedent for the level of quality that can be achieved in the fast-growing, affordable smartphone segment.” Said Mr. P Balaji, Managing Director, Nokia India. Nokia X comes with Fastlane, a screen which lets people switch between their favorite apps more smoothly. People can access curated, quality-tested apps from Nokia Store, more than a dozen third-party app stores and by side loading. All devices are also pre-loaded with a variety of very popular third-party apps and games such as BBM, Twitter, Facebook, Plants Vs. Zombies, etc. Out of the box, consumers can enjoy signature Nokia experiences including free HERE Maps, with true offline maps and integrated turn-by-turn navigation, and Nokia MixRadio for free music streaming and downloadable playlists. The Nokia X is also an affordable introduction to popular Microsoft services, including 7GB free cloud storage using OneDrive and additional 3GB if consumers enable camera back up. The first offering is the Nokia X, a beautifully crafted smartphone with Nokia’s signature design approach and bold, bright colours. At only 10.4mm thin, the slim, durable monobody design features a 4” scratch-proof display and exchangeable back covers that come in a variety of statement colours. Inside, the device runs on the Nokia X Software Platform and is powered by a1Ghz dual core Qualcomm Snapdragon processor. 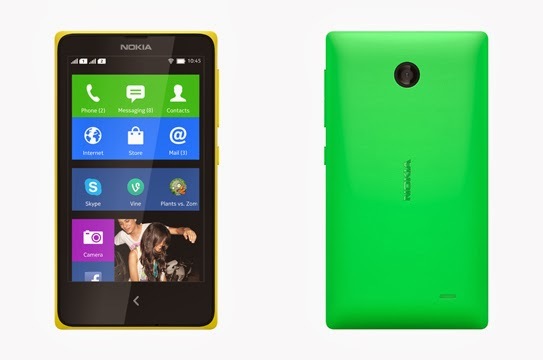 The Nokia X features two screens: home, which features a fresh, tile-based design and Fastlane. Fastlane is a dynamic record of how people use their phone, day by day, moment by moment. It captures everything people love: they need only to swipe once from the home screen to access Fastlane, see a record of recent activity, and switch between their favourite apps, smoothly. Fastlane has been completely re-imagined for the Nokia X family. People can return a missed call by calling or texting, accept or decline calendar invitations, or control the music player – all from within the Fastlane view. Fastlane is also more customizable and social-friendly than ever. People can select what appears on their Fastlane feed, read notifications from their social networks and update their status from within Fastlane, making the experience even more productive.